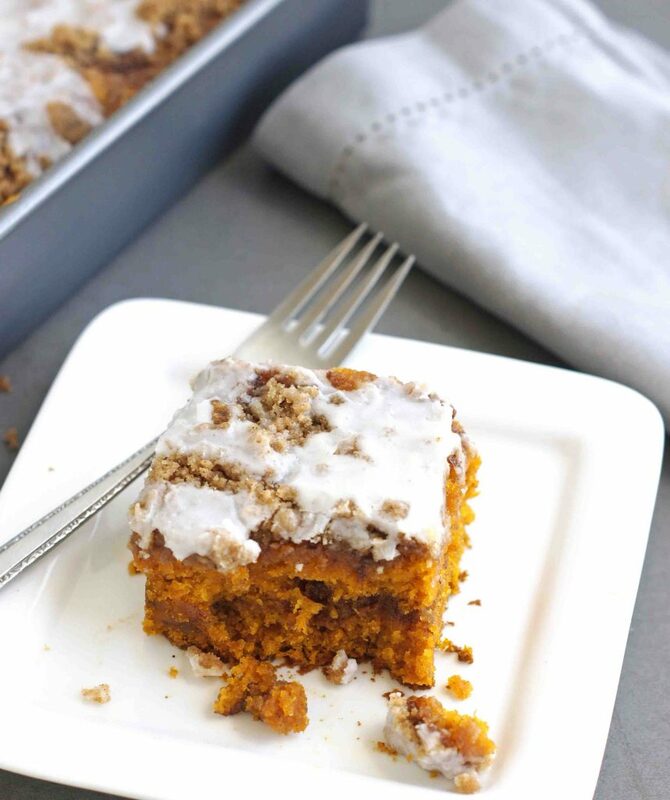 This Cinnamon Swirled Pumpkin Coffee Cake is dense, not too sweet and has swirls of buttery cinnamon-sugar yumminess throughout. It’s delicious. 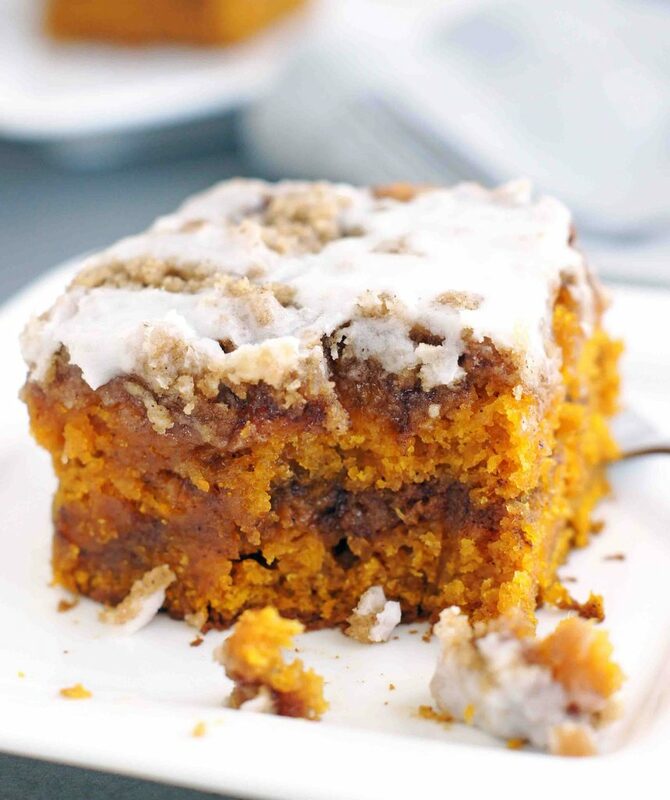 I think I died and went to pumpkin heaven when I took the first bite of this cake. Now while chocolate will always be my first true love, anything pumpkin is a close second. Yeah, this cake is a winner! 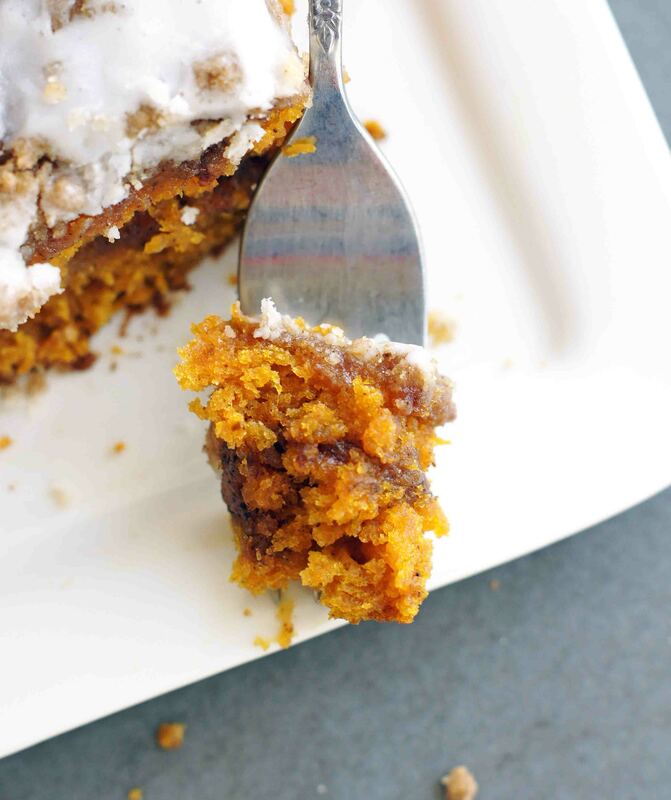 I look at it this way, it’s loaded with pumpkin so by consuming mass portions of this cake like I did, I easily got my fruit intake for the week, right? I think I waited a wee bit too long before I poured the glaze over it. If the cake had been just slightly warmer, the glaze would have seeped down into the cake a little more, which could only make this cake even more spectacular. To make the cake: Preheat oven to 350°F. Spray 9x13 baking dish with cooking spray. In a large bowl, whisk together the flour, baking soda, baking powder, salt and cinnamon. Set aside. In the bowl of a stand mixer, beat the butter and sugars together until light and fluffy. Add the eggs and vanilla and mix well. Stir in the pumpkin puree, mix until well combined. Add flour mixture and stir until just combined. Spread half of batter in the prepared baking pan. Pour half of the cinnamon swirl over the batter and using a knife, lightly swirl it through the batter . Top with the remaining batter and repeat with the remaining cinnamon swirl mixture. Sprinkle with the crumb topping. Bake coffee cake until a toothpick inserted in center comes out clean, about 45 minutes. Cool 20 minutes before glazing and serving. To make the cinnamon swirl: In a small saucepan melt the brown sugar, butter and cinnamon, stirring constantly. To make the crumb topping: Add all of the ingredients to a medium bowl. Using a pastry cutter or two knives, cut the butter into the flour mixture until it resembles coarse crumbs. To make the glaze: Whisk together the ingredients in a small bowl. Yum! Just reading the ingredients had my mouth watering! Hi Linda! Just wait until you taste it. You won’t be able to stop eating it! Mel, you HAVE to make this! It is amazing. I honestly had to give half of it away or I would have eaten the entire pan (I’m not even joking!). Hope you guys are doing well! So freakin’ good!! I couldn’t stop eating it. Made for a very yummy breakfast! This is so good!! Very moist and just melts in your mouth! I did make a full recipe and a half recipe and both turned out great. Oh I knew you’d love it Christine. Did you use a 9×9 pan or an 8×8? I made half this recipe and baked it in a 9X9 pan for only about 5 minutes. It was so very good. I love so many of your recipes. Just made your amazing coffee cake ! I have no words… wonderful !! Hi Paula! 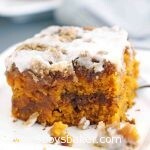 I love your comment, because you’re right, there are no words for this coffee cake! Thanks for leaving a comment.